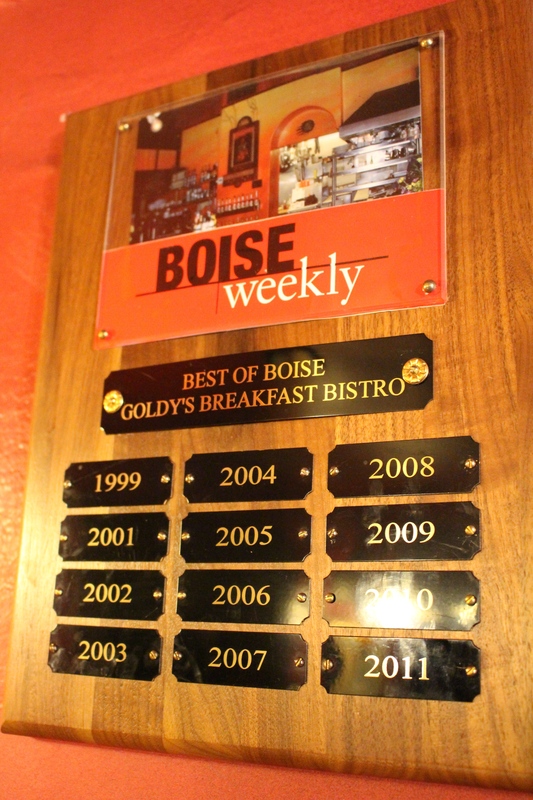 Goldy’s in Boise: Breakfast that sticks with you | Oh, the Places We See . . . 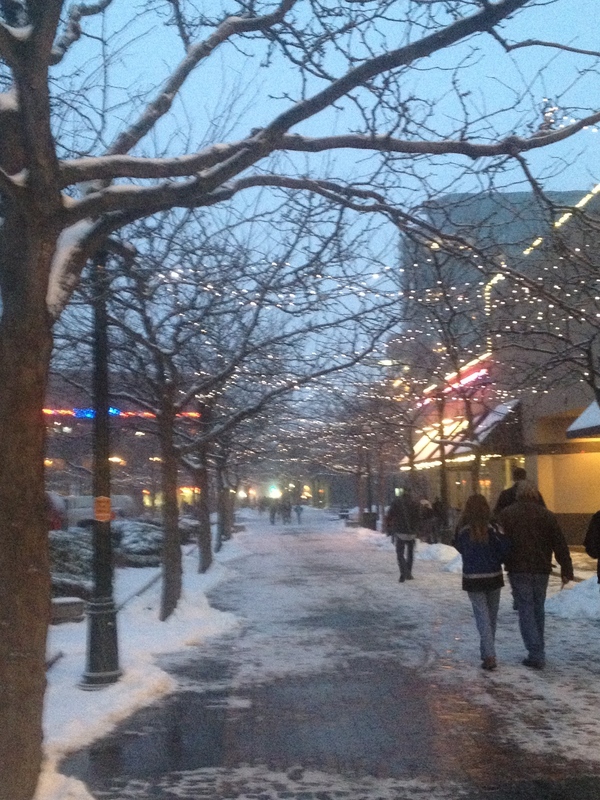 So, when an unexpected snowstorm covered Boise, Idaho, closing schools (where I work) and some businesses, we just looked at each other and grinned. It was our chance! Donning all the warm clothing we’d packed, we went in search of adventure. First up, breakfast. A gentleman dressed in business attire braving the elements to get to the office answered our query about where locals would eat: Oh, you’ve got to go to Goldy’s. It’s the best breakfast anywhere downtown. Little did we know how right he was. 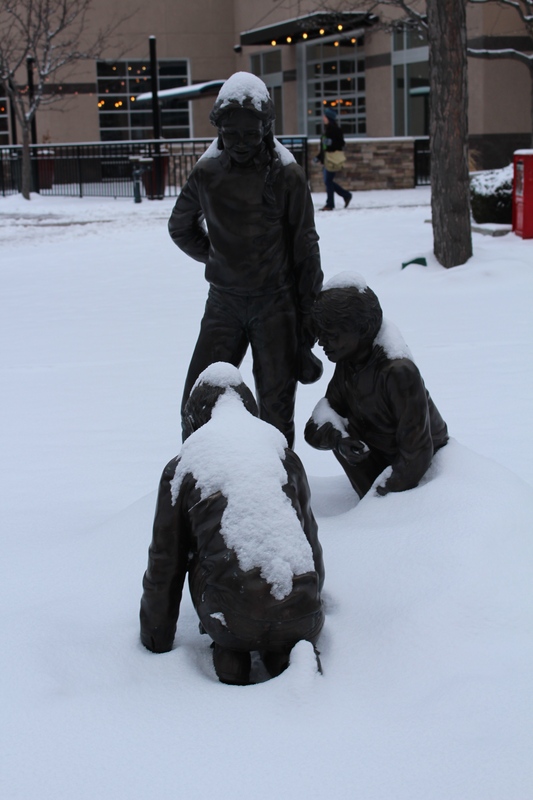 On this snowy day, Goldy’s was packed! 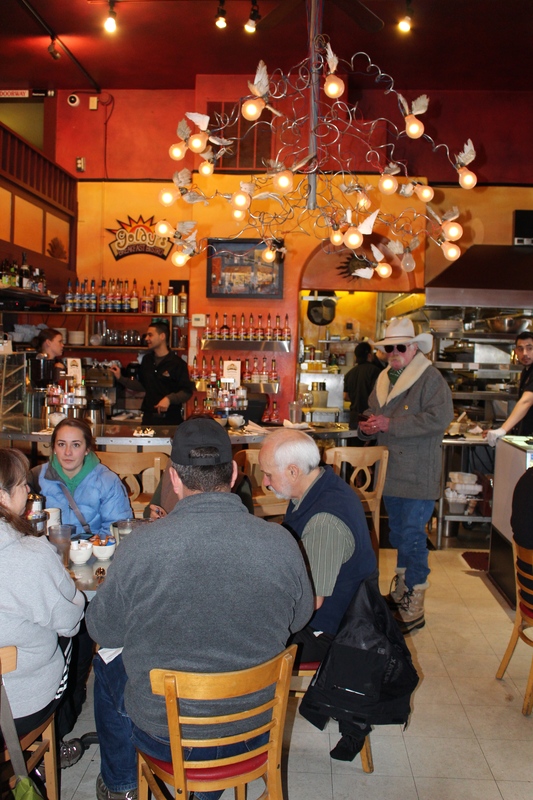 Owner Wanda Martinat, who with her husband Randy opened the restaurant in 1999, spread open the draperies blocking the cold from the front door and welcomed us to the warmth, comfort, and eclectic close-knit interior of Goldy’s Breakfast Bistro. Goldy’s warm, welcoming interior. Check out that chandelier! After a brief wait, we were directed upstairs to the balcony section where our table for two offered us a front-row seat to the action downstairs. We have no idea what the ratio of waiters to customers is, but it seemed two to one. Coffee flowed, menus arrived, and orders were taken in record time. 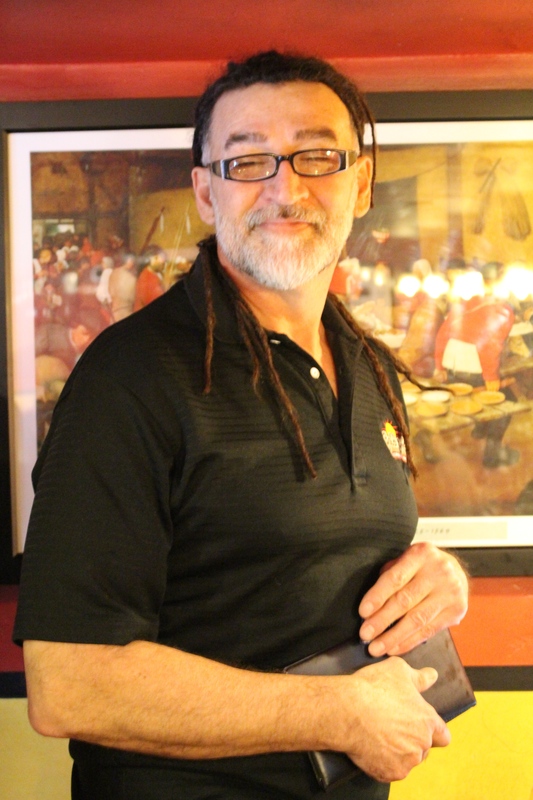 “Been workin’ at Goldy’s for 13 years,” our waiter told us! And then the food rushed in! Bountiful breakfasts any way you like it. In fact, the Create Your Own Breakfast page offers three columns of choices: Meat, Potatoes, and Bread. Eggs, too, any way you like ’em: Soft Boiled, Poached, or Basted. And meats we’d never heard of — Basque Chorizo (large Basque community in Boise), Turkey Apple Sausage, and Maple Sausage — and specials like PEPS (Goldy’s cheese, peppers, and onions) and Bread Pudding Muffins filled the menu. Another whole page offered Hollandaise Specialties like this new-to-us item: Spicy Chicken Benny with English muffin, chicken, spicy Hollandaise sauce, and bacon!!! 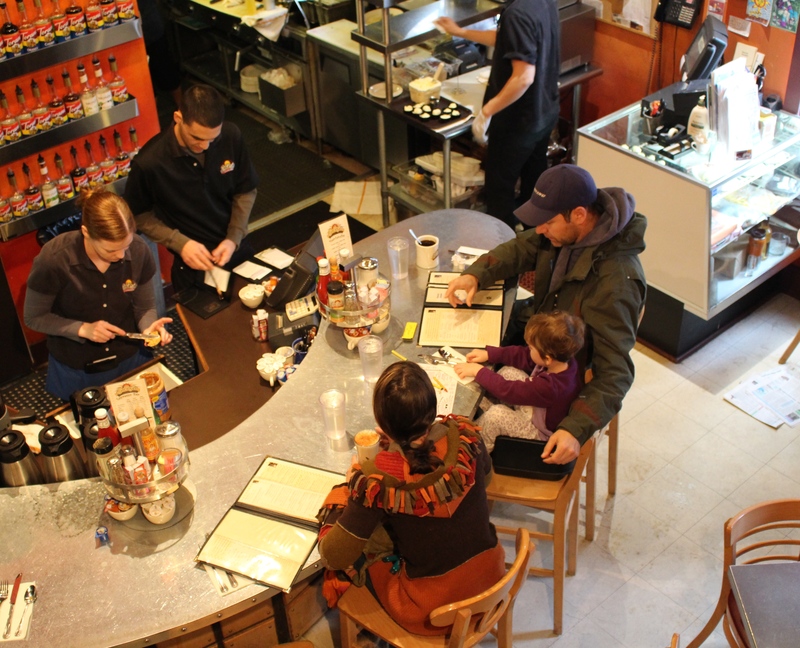 Round all this out with entrees like Spinach and Italian Cheese Frittata or Smoked Salmon Hash, and you have a diner unparalleled in all of Boise — not just downtown! 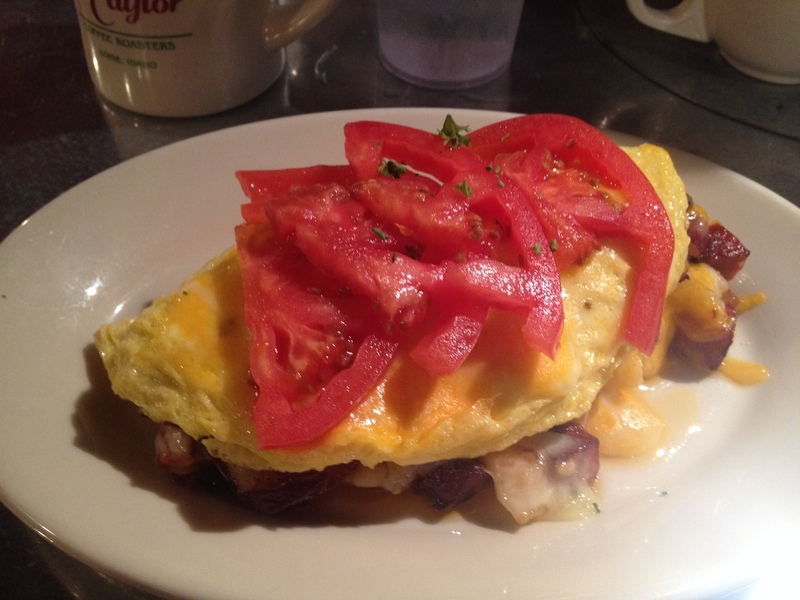 Bert couldn’t resist the three-egg omelet with hash browns and sausage. 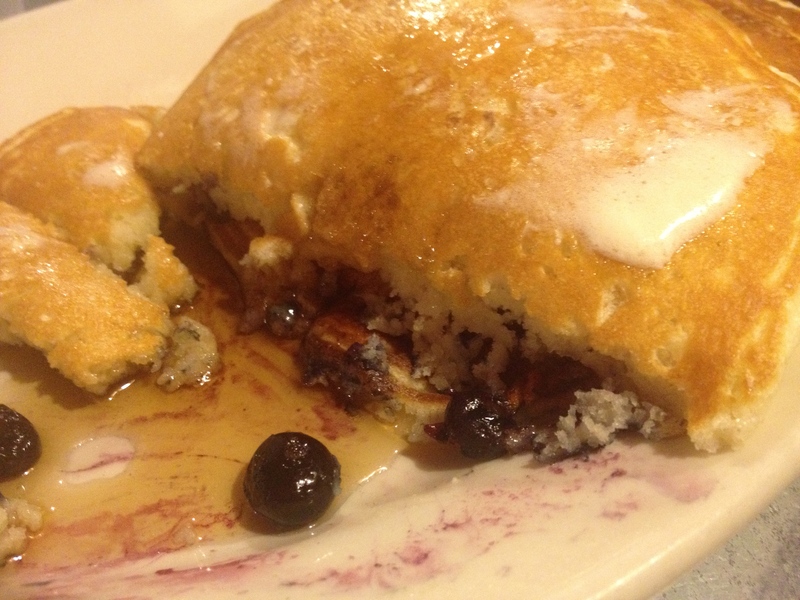 And I dug into a huge stack of Blueberry Pancakes with blueberries all the way through. 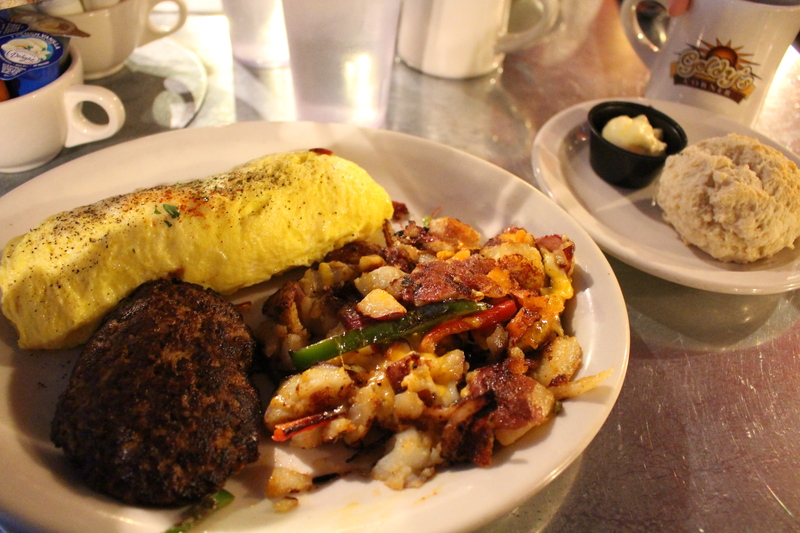 We even returned the next day and ordered the special: Cajun Sausage Omelet . . .
And Corned Beef Hash with Basted Eggs. 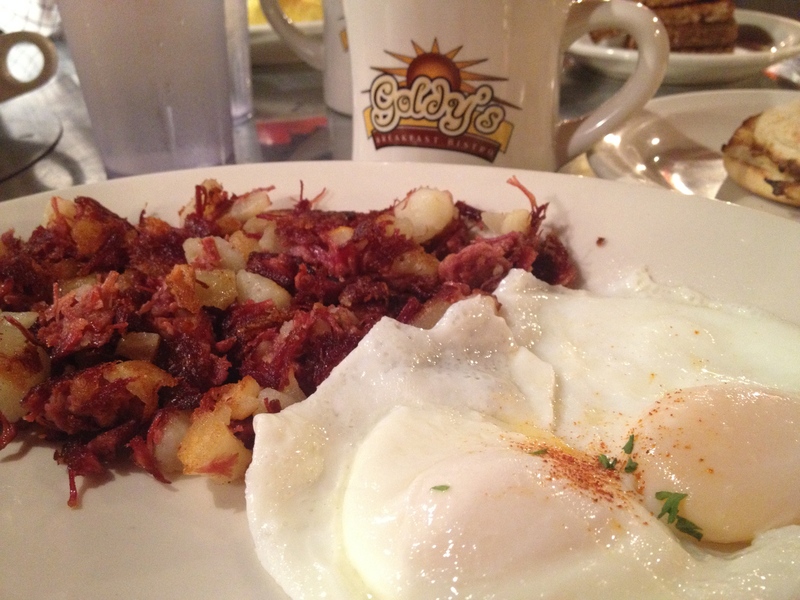 Awards pour in for Goldy’s (Click here to read awards/reviews), and it’s no wonder. 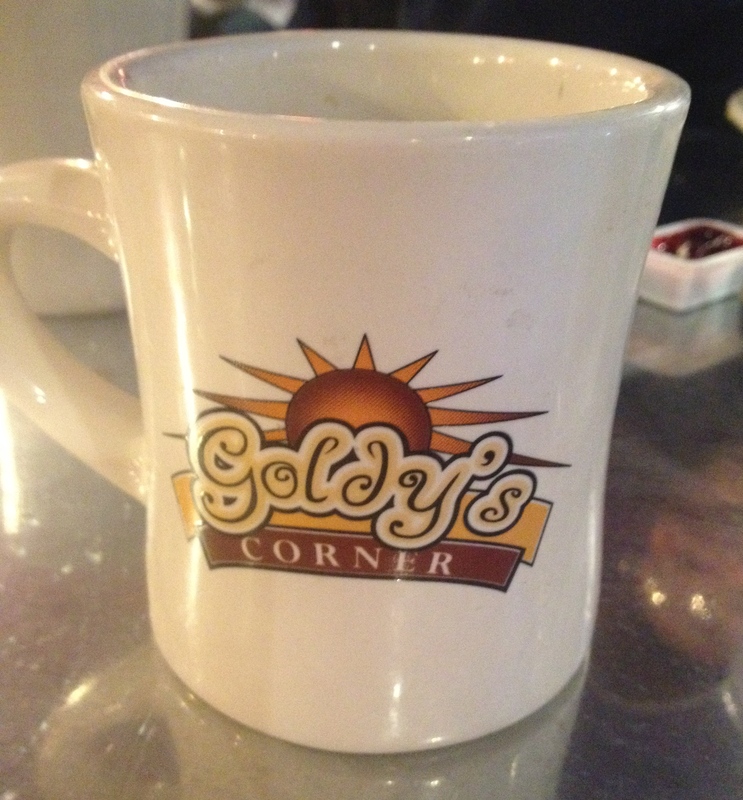 With great service and unique menu, Goldy’s is a hit with locals and tourists like us. Stumbling onto Goldy’s was our good luck. And now we say If Guy Fieri returns to Boise, he’d want to share the place on Diners, Drive-Ins, and Dives! In fact, Goldy’s can make anyone’s day. To see all the food places in Boise featured in Diners, Drive-ins, and Dives, click here. For more posts on our travels in Idaho and Washington, click on the Inland Northwest page at the top of this blog. This entry was posted in Idaho, Restaurant, Travel and tagged blueberry pancakes, Boise, coffee, Goldy's Breakfast Bistro, Guy Fieri, hollandaise, omelet, Randy and Wanda Martinat. Bookmark the permalink. Pingback: Discovering Boise: Six places to eat you won’t find back home! | Oh, the Places We See . . .
Rusha! When we saw Willie Nelson last summer, we waited for over an hour to experience this place. It was WELL worth it. Even cooler? We sat at that table you pictured. I LOVE this world! You picked a great place to dine even if you did have to wait. Now about Willie Nelson . . . was he in Boise doing a concert? And you got to go? Did Chloe go, too? Soooo jealous! Thanks for sharing! what a wonderful place. i love going out for breakfast. . . . . any time of the day ! We do, too! 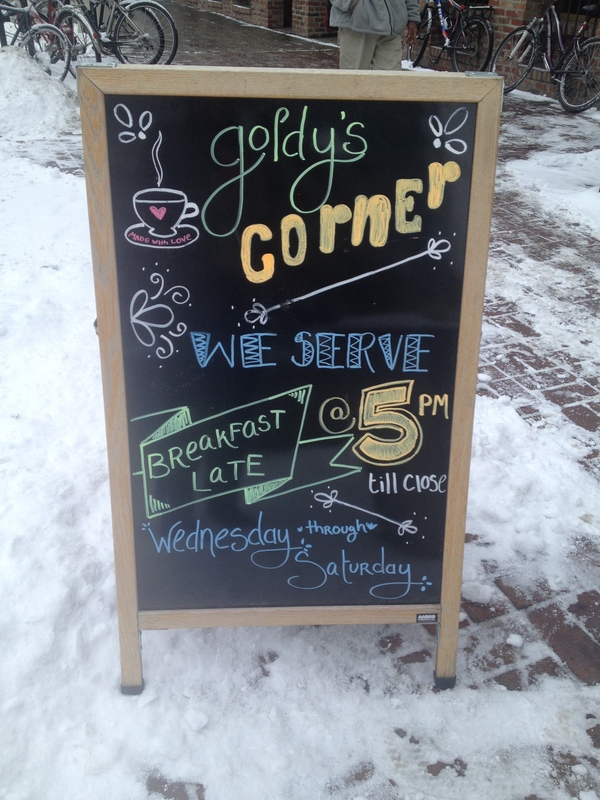 And if you eat a Goldy’s around 9 or 10, as we did, you may not have to eat anything else the rest of the day! Thanks for reading! Sounds great as we try to do the same thing especially on Saturday.. . . . I like the way you you get around and clearly *live*. What a great brunch! You’ve done our favorite thing – “ask the locals” !! They ALWAYS know the best spots which are seldom featured in the darned tourist/hotel recommendations. Goldy’s looks Fantastic!!! It was a find, indeed! And it was one of those local spots where everything worked: service, food, ambiance. Wish I were having breakfast there now! A few years ago I had a chance to visit Boise. It was a summer trip, a very beautiful city! We would come back any time! Friendly people, great restaurants, lots of things to see. Thanks for reading!